We’d love your help. Let us know what’s wrong with this preview of A Wild Ride by Niki Danforth. When her father unloads from his trailer the old Upon waking on the morning of her tenth birthday, Moxie Wyoming Woodson embarks on a summer of magic, mayhem and adventure. With rodeo champion Granny Rose as her inspiration, Moxie’s birthday dreams kick up visions of a fine young horse that will also help her take on the more grown-up chores on her family’s Wyoming ranch. To ask other readers questions about A Wild Ride, please sign up. 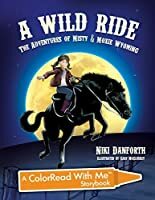 A Wild Ride: The Adventures of Misty & Moxie Wyoming, A ColorRead with me Storybook, by Niki Danforth, is a delightful book for young readers to share with their families. Moxie, a 10 year old farm girl, receives a special present from her grandpa for her birthday - a horse named Misty. Af first, Misty looks old and plain, but Moxie soon learns that she can talk to Misty, and Misty understands. In more ways than one, she's a magical horse. Moxie, her friend Pickle, and Misty soon take off on A Wild Ride: The Adventures of Misty & Moxie Wyoming, A ColorRead with me Storybook, by Niki Danforth, is a delightful book for young readers to share with their families. Moxie, a 10 year old farm girl, receives a special present from her grandpa for her birthday - a horse named Misty. Af first, Misty looks old and plain, but Moxie soon learns that she can talk to Misty, and Misty understands. In more ways than one, she's a magical horse. Moxie, her friend Pickle, and Misty soon take off on a daring, fantastical adventure that will help save a group of threatened Mustangs. The story comes to life through beautifully drawn pencil illustrations, and children will no doubt love that this ColorRead with me Storybook allows them to color in the characters. Though my children liked the e-version of A Wild Ride, this particular book is definitely one that will be enjoyed most as a paper edition. With gorgeous drawings, an adventurous and magical story - and a lovely message of caring for our animals and our friends - Misty & Moxie Wyoming is a story to be shared and loved. A Wild Ride: The Adventures of Misty and Moxie Wyoming, A ColorRead With Me Storybook is such a cute story. My horse crazy daughter loved it. It is so magical and delightful and is full of beautiful and creative illustrations that can be colored by the readers. What a genius idea it is to get the readers into the story? The story, also, teaches children a wonderful lesson, that even adults should be reminded of. This is one book that children will want to read again and again. I recei A Wild Ride: The Adventures of Misty and Moxie Wyoming, A ColorRead With Me Storybook is such a cute story. My horse crazy daughter loved it. It is so magical and delightful and is full of beautiful and creative illustrations that can be colored by the readers. What a genius idea it is to get the readers into the story? The story, also, teaches children a wonderful lesson, that even adults should be reminded of. This is one book that children will want to read again and again. This was a fun story for children with the great idea of coloring along with the story, and it had a great message as well! Moxie Wyoming and her horse Misty, as well as a few other friends, discover a plot some bad guys have to steal wild horses! How do they go about thwarting the bad guys? Read the book and find out! This is such a cute book. I love the pictures, I love the story and I adore that you can continue with story in the novel: A Wild Ride: The Adventures of Misty & Moxie Wyoming. This is such a cute character and fun for all ages. I highly recommend this book to others and I can not wait to read the novel. Great message. Love love loved it. My copy was in pdf style, which isn't the best way to experience this book. I have never heard of a ColorRead With Me storybook before but after seeing this one, I think they are a neat idea. I will include the Note to Grown-ups from the Author in my review. This note explains the purpose of the book as the author intended it. "Many of this book's illustrations were well-suited to live drawings, but a few of the gorgeous drawings were so detailed that we let them alone so readers can enjoy the ar My copy was in pdf style, which isn't the best way to experience this book. "Many of this book's illustrations were well-suited to live drawings, but a few of the gorgeous drawings were so detailed that we let them alone so readers can enjoy the artwork. Other pages can be colored while still providing details from the artist. This ColorRead with Me Storybook is an opportunity for kids to bring their own creativity to the process of what the artist has already started. Appropriate for ages five and up"
The story tells of a young girl named Moxie, who is given a special present from her grandfather. The book opens up with the special delivery on her birthday. A new horse called Misty is presented to her but Moxie is secretly disappointed. Her grandfather assures her that Misty is very special and Moxie will love her just as much as her grandmother did. The next day, Moxie is at a rodeo and over hears the Jenkins brothers talking about they next adventure. Then she has another run in with the brothers on her four wheeler. Moxie keeps hearing about he wild horses from people in town. She becomes worried for them. Meanwhile, Moxie and Misty begin to get to know each other. Moxie gets some new pink cowboy books and discovers that Misty has abilities?!? Together the two set out on an adventure to solve the mystery surrounding the wild horses. This is quite a cute book. As an adult reading the story, I found areas that I would normally want more information on to flesh out the story more. However, it seems there is a full length novel of the story and this has been condensed for the purpose of the ColorRead with Me. I really enjoyed the story line and there is a lesson to be learned from Moxie and Misty. My children both enjoyed the story. My daughter probably appreciated it more so than my son. My daughter is our artist so she would have loved to color in the pages. Overall, the pictures in the book are quite well done. I love the look of the book. I love the idea of the ColorRead with Me book. The book is 56 pages long with plenty of coloring opportunities. This would even be fun for adults that like to color. The story is well thought out and entertaining. I would recommend this book for children who love horses but really everyone. Horses do play a large part in the book and the country, small town life is what the picture show. We loved it. Excited for her tenth birthday, Moxie Wyoming Woodson wakes up and rushes out to find if she’s lucky enough to get her own barrel racing horse. She is even more excited when she sees her dad getting ready to head out with the empty horse trailer. Patiently she waits for her father to get back from his “fence-fixing” trip, only to be disappointed when he comes home and leads out a very old and very sway-backed grey-flecked black horse. With instructions that she’s to love and care for this specia Excited for her tenth birthday, Moxie Wyoming Woodson wakes up and rushes out to find if she’s lucky enough to get her own barrel racing horse. She is even more excited when she sees her dad getting ready to head out with the empty horse trailer. Patiently she waits for her father to get back from his “fence-fixing” trip, only to be disappointed when he comes home and leads out a very old and very sway-backed grey-flecked black horse. With instructions that she’s to love and care for this special horse, Moxie Wyoming throws a little tantrum but is surprised when the horse winks at her. Wait a second, the horse winks? It doesn’t take long for Moxie to realize that there’s more than what meets the eye with her new horse, Misty. A Wild Ride, The Adventures of Misty & Moxie Wyoming is a storybook for children combining a storybook and a coloring book. I had mixed feelings about this book which seemed a little slow to get started. I tried putting myself in the mind of a younger child. I have children and I have worked with children at school for years and I think I have a pretty good grasp of things they like to read. The pictures and illustrations were awesome! I always wished I could draw like that! The story seemed A Wild Ride, The Adventures of Misty & Moxie Wyoming is a storybook for children combining a storybook and a coloring book. I had mixed feelings about this book which seemed a little slow to get started. I tried putting myself in the mind of a younger child. I have children and I have worked with children at school for years and I think I have a pretty good grasp of things they like to read. The pictures and illustrations were awesome! I always wished I could draw like that! The story seemed a little sporadic and sometimes steered off topic and might have been too complicated for this age group. I think after 4-5 pages it seemed to do better and the adventure started to take shape. Near the end I was enjoying myself. I would have a hard time putting an age group on this but I’m thinking about 6-8 years old might be an average target. All in all it turned out to be a good little story. This is a great book for a young child. Full of real life things that do happen and its full of fun wonderful things as well. 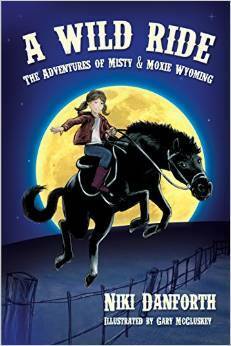 A Wild Ride: The Adventures of Misty and Moxie Wyoming by Niki Danforth centers on Moxie Wyoming who is turning ten. She had always wanted to be like Granny Rose and imagined herself barrel racing and winning first prize, just as Granny Rose had done long ago. On her birthday she got a horse, but Misty was not what she expected. One day Moxie and her best friend, Pickle, h This is a great book for a young child. Full of real life things that do happen and its full of fun wonderful things as well. One day Moxie and her best friend, Pickle, heard about some wild Mustangs in the surrounding areas. She and Pickle embarked on an adventure to find out more about these wild Mustangs. In the meantime, Moxie began to learn more about Misty. One day she discovered that Misty is no ordinary horse; she has magical powers. Misty, Moxie and Pickle decide to work together to see how they can help free the wild Mustangs ... and the adventure begins. This is a very cute book about a girl and her love for horses. I love the coloring pages that go along with the story. Wish I had had some of these when I was growing up. I think this book shows a great lesson learned in that you may not get exactly what you wish for, but sometimes what you get is better that you ever imagine. I would think any horse loving child would love this book. I received this book in exchange for my opinion. My opinion is my own. In a series of vignettes interspersed with wonderful drawings and coloring book outlines we are introduced to Moxie and Misty and their magical adventures. The breaks in the story present opportunities for discussion as parents read aloud to their younger children or have their children read to them and the illustrations are just begging for crayons and colored pencils. And at the end of the chain of tales a mystery has been solved and animals rescued. This is such a great book both for children and adults who buy it. The story is simple and really nice and it talks about important arguments such as family, friendship and animals safety. Another thing that I appreciate is the fact that during the entire story the main character and her granddad exchange some letters. Finally the drawings are very cute and they are a wonderful way to enjoy more the experience of a fun reading. Wonderful coloring pages! A great pet rescue fantasy for young animal lovers. Moxie’s and Misty’s adventures continue as each adventure teaches some facts on animal care. The author’s imaginative plots add a young “super hero” flavor to the stories that I bet most children would love to have, so saddle up! A Wild Ride is a fun book to read. Moxie and her horse, Misty, work together to foil a gang of rustlers. This book comes with wonderful illustrations and coloring pages, both enhance the reading fun. I recommend A Wild Ride to young readers of all ages. A Wild Ride: The Adventures of Misty and Moxie Wyoming by Niki Danforth centers on Moxie Wyoming who is turning ten. She had always wanted to be like Granny Rose and imagined herself barrel racing and winning first prize, just as Granny Rose had done long ago. On her birthday she got a horse, but Misty was not what she expected. Misty had a sway back, was more than thirty years old, and reigned as the queen of the herd. In her day she would always be out front, leading the herd back to the corra A Wild Ride: The Adventures of Misty and Moxie Wyoming by Niki Danforth centers on Moxie Wyoming who is turning ten. She had always wanted to be like Granny Rose and imagined herself barrel racing and winning first prize, just as Granny Rose had done long ago. On her birthday she got a horse, but Misty was not what she expected. Misty had a sway back, was more than thirty years old, and reigned as the queen of the herd. In her day she would always be out front, leading the herd back to the corral, but now she was retired from the Darwin Ranch near Jackson. One day Moxie and her best friend, Pickle, heard about some wild Mustangs in the surrounding areas. She and Pickle embarked on an adventure to find out more about these wild Mustangs. In the meantime, Moxie began to learn more about Misty. One day she discovered that Misty is no ordinary horse; she has magical powers. Misty, Moxie and Pickle decide to work together to see how they can help free the wild Mustangs ... and the adventure begins. I must say that I think this book will become an instant classic for young girls. I was taken with this books charm and characters. It will transport you back to your youth while reading. It is nice to see an author writing for young girls as something other than being a princess or being part of a gossip club. This is truly inspiring for young girls. The illustrations throughout the book are beautiful just like the story. I remember as a young girl wanting to live on a ranch with my own horse ju I must say that I think this book will become an instant classic for young girls. I was taken with this books charm and characters. It will transport you back to your youth while reading. It is nice to see an author writing for young girls as something other than being a princess or being part of a gossip club. This is truly inspiring for young girls. The illustrations throughout the book are beautiful just like the story. I remember as a young girl wanting to live on a ranch with my own horse just like Moxie. Moxie is so excited when she wakes up on her 10th birthday. She has been dreaming of her own horse for years. She wants to be a barrel racer and win lots of awards like her Granny Rose. But, as we all know things don't always work out the way we plan in our heads. Moxie does get a horse but not the young one she was hoping for instead she gets Misty a 30 year old black mare with a sway back. That night when she has taken care of Misty and gone to bed she reads a note that was left for her under her pillow. Her Grandpa had left it for her saying that Misty may not look it but she is a very special mare and give her a chance. Special??? This wonderful book has it all from wild horses, bad guys, adventure, mystery, and even some magic? I recommend this book to those from 5 who need it read to them to 9 and up who will enjoy it on their own. I enjoyed this book because of my adventures of having a horse when I was young. My children also enjoyed this book. Moxie Wyoming is hoping for a horse for her tenth birthday. She is very disappointed when her father leads a gray speckled, swayback mare off the trailer and says “Happy birthday!” Definitely not the horse she had been hoping for. But as Moxie gets to know Misty she discovers that Misty has some magical powers of her I received a copy of this book in exchange for an honest review. Moxie Wyoming is hoping for a horse for her tenth birthday. She is very disappointed when her father leads a gray speckled, swayback mare off the trailer and says “Happy birthday!” Definitely not the horse she had been hoping for. But as Moxie gets to know Misty she discovers that Misty has some magical powers of her own. Together, the two lead a herd of wild mustangs to safety away from some mustang rustlers. Moxie learns that you can’t judge a book by its cover. This is a cute chapter book for intermediate readers. My children ages 11 thru 14 loved it. Definitely an enjoyable magical tale. Although part of a series, a great stand alone novel. 1. Don't judge a book by its cover - Moxie wasn't too excited to receive her "new" horse Misty because of her age, but they ended up being best friends and having great adventures together. 2. No matter your age, you can make a difference in the world and help those less fortunate than you - whether human or animal. 3. Animals deserve fair treatment, and should be loved and cared for. What a cute story about a little girl named Moxie with moxie to spare! I read this with my eight year old daughter who is a horseback rider. She did NOT like the "bad cop" aspect in the story but everything else held her attention in a positive light. She was really surprised with the magical aspects of the story at first but she related it to "The Magic Treehouse" books that she has read. It's a light hearted "go girl" sort of a story with history, present and dreams. What more would a young girl What a cute story about a little girl named Moxie with moxie to spare! It's a light hearted "go girl" sort of a story with history, present and dreams. What more would a young girl want in a story? It was said to be for ages 7-12 and suitable for as young as 5. I think it would appeal most to the younger part of that range but not as much to the older end of the scale. This was a fun book to read. I think there might be a sequel! This story takes place in Wyoming on Moxie's birthday. She is joined by her parents, pet dog Bunker, a new horse named Misty, and her best friend Pickle. This adventure is a mystery mixed with magic that is sure to please. I think I remember something about pink boots! A herd of wild horses are seen in the area and the ranch owners are on edge. Moxie and Misty are determined to find a way to keep them from being stolen and sold. The aut This was a fun book to read. I think there might be a sequel! The author uses this interesting story to weave in art, imagination, and creativity into the lives of children. At the end of the story are two nice articles, one about the real people in the story and the other one is about Grizzly bears. I read this book with my little daughter in mind and have to give it 5 stars for adorableness. The pictures were a wonderful addition. An adventurous girl with a pretty cool mouthful of a name, Moxie Wyoming Woodson, dreams of having a horse. On her birthday, she is thrilled when her dad pulls in with a horse trailer and expects her dreams to come true. She is quickly disappointed when she sees an old horse come out instead of the beautiful one of her dreams. The horse, Misty, is special in her I read this book with my little daughter in mind and have to give it 5 stars for adorableness. The pictures were a wonderful addition. An adventurous girl with a pretty cool mouthful of a name, Moxie Wyoming Woodson, dreams of having a horse. On her birthday, she is thrilled when her dad pulls in with a horse trailer and expects her dreams to come true. She is quickly disappointed when she sees an old horse come out instead of the beautiful one of her dreams. The horse, Misty, is special in her own way and Moxie and Misty head off on adventures filled with mystery and growing up. I thought it was engaging and can’t imagine any young girl not being hooked right away. Pink boots, a flying horse and horse wranglers…what fun! A birthday that is so full of expectations but disappointment happens in the form of an old sway back horse. But pink magic boots are pretty cool. And a horse that gets younger when he flies is really magic. The story shows farm life and responsibilities mixed with a story of wild mustangs. The author created a story that entertains by creating a fantasy amid the reality. I enjoyed the story. It was a fun story. It is not aimed at my age g Pink boots, a flying horse and horse wranglers…what fun! A birthday that is so full of expectations but disappointment happens in the form of an old sway back horse. But pink magic boots are pretty cool. And a horse that gets younger when he flies is really magic. The story shows farm life and responsibilities mixed with a story of wild mustangs. The author created a story that entertains by creating a fantasy amid the reality. I enjoyed the story. It was a fun story. It is not aimed at my age group but I still liked it anyway! I did receive this book in exchange for an honest review. Niki Danforth, daughter of a Cold War covert intelligence officer, has the "thriller/adventure" gene in her DNA. After a career as a successful TV/video producer and director in New York, this empty-nester is picking up her first love of mystery books and recreating herself as an author in the genre. Danforth lives in the New Jersey countryside with her husband and two drama-queen dogs.